Troy Williamson returns to the ring on November 24th as he looks to extend his professional record to nine fights without defeat and bounce back to winning ways in style following a controversial draw with Jack Flately in June of this year. 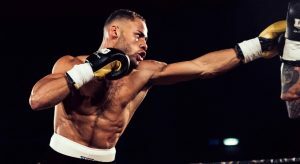 A standout amateur, former English national champion, Williamson competed four times in the World Series of Boxing and, at 27 years of age, the Trojan is on a steady course to make his mark in the paid version of the sport; 7-0-1 since ticking over in October 2016, the Darlington man has grown into his power and has racked up five wins inside the distance, dropping Flatley in their fight and proving his pedigree with every passing contest. Troy, great to speak to you, let’s start off at the beginning with how you got into the sport of boxing? I went when I was about 10 years old but I was a little too young to compete so I got playing football from 11 to 16 because, if I’m honest, I just wanted to be able to compete in something but I went back to the gym when I was 16, to the local boxing club and I decided to stick at it. And you had a very good amateur career, English national champion, how much did that help the transition into the pro game? Yeah it helped a lot because, obviously, I was travelling all other the country and abroad all the time to fight some of the best in the world and I was doing it frequently, the fights had less time between them, and I was only there for about two years but I boxed the world number one twice and the rounds I got under my belt helped my development. Of course you were involved with the World Series of Boxing, what was that like in to compete in? It bridged the gap between amateur and professional, it’s far more like professional boxing and it gives you a taste of what that’s like so it’s a really good experience. As a professional you’ve got seven wins and one draw, are you pleased with your development? Yeah it’s been good, I’d like to be a little bit busier in the ring and get out more regularly but I’m happy with how I’ve performed in each of the fights and myself and my trainer can see elements where I’ve been improving so it’s going well. What has been your most pleasing performance? The one in my home town, Darlington, if I’m honest, in May this year. I stopped Michael Mora in the second round in front of my home support and I dropped him twice so that was a good scrap and it felt good to do it in front of the fans, too. You’re out next on November 24th, what fight are you hoping for from the opponent (Darryl Sharp)? Like you say, I’m boxing Darryl Sharp and he’s a tough contender. Think he’s got 40 losses but only been stopped once, a Central Area champion, so I’m expecting him to take me six rounds, I’m preparing for six and I’m preparing for a tough fight. Let’s talk about that last fight with Jack Flately, many people had you winning, talk us through it from your perspective? Well I thought I won and I thought I won comfortably. I did more than enough, if I’m honest. I dropped him in the first so there was a 10-8 round in my favour and the referee scored it 76-76. I can’t dwell on it but at the time it felt like a loss. Hopefully we can get a rematch and I’ll put the record straight. Are you desperate to put it to bed or are you happy moving on? If it happens it happens mate, I’m not going to shout for a second one but I’m happy for the rematch to happen. It was called a draw, I know, and in hindsight it’s given me the hunger for success and it’s done me a world of good. Obviously I’d have preferred the win, don’t get me wrong, but it’s made me hungrier and, like I say, it felt like a loss and I never want to feel like that again. Obviously you’ve been out sparring Denis Radovan, what’s that been like as an experience? Good experience and I’ve sparred him before, apparently, when I was with Great Britain but I had no clue about that until he told me when I got there. He told me we’d shared the ring before but it was a good couple weeks, strong kid, fast-paced spars and I’ll travel anywhere to spar because there’s not much around in the North East but I don’t mind that, really, it opens up doors for me. The harder you train the easier it is to put things into place in the ring, no fight is easy but it gets easier to work your way around the fight and you’ve got to be switched on but those experiences help. When can we see you fighting for title then, Troy? Hopefully early next year, my last fight kind of put me a step backwards and I had one foot back but I’m still hoping that I can get a title early next year. Do you prefer rounds or knockouts at this stage in your career? I never go into a fight looking for a knockout but if the knockout is there than that’s great for the viewers watching but I’ll always have a game-plan that accounts for going the distance because I’ll never want to rush the shots and risk walking onto one myself. As long as I’m winning, I’m happy!